YouTube, which is designed especially for sharing videos, has become more and more popular in the world since its founded date – Feb 14th, 2005. Nearly any type of videos you would like to watch can be found on this website because it hosts a wide variety of contents. While watching videos, if you just come across audio playing in the videos you want to put on your iPhone, iPad, burn to CD, save to computer, etc, how do you achieve that? As we all know, there is no any workable button like “record audio” on YouTube. Don’t worry. We can use some third-party tools to record YouTube audio directly. Tips: The tools we are going to share with you below are compatible with Windows 10, 7, 8, Vista, XP and Mac OS X El Capitan, Yosemite, Mavericks, Mountain Lion and all other versions. 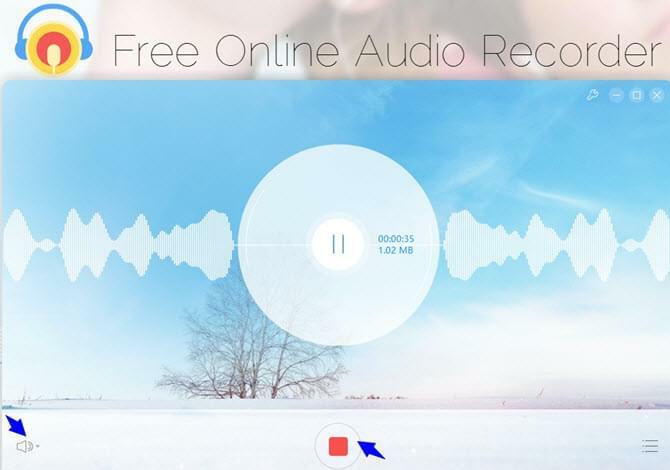 Free Online Audio Recorder is a web-based application developed by Apowersoft Company. No registration or any subscription required, you can start to record audio from system sound, microphone or both of them very conveniently and simply. Based upon “what you hear is what you record” theory, there is no quality loss for the output audio. 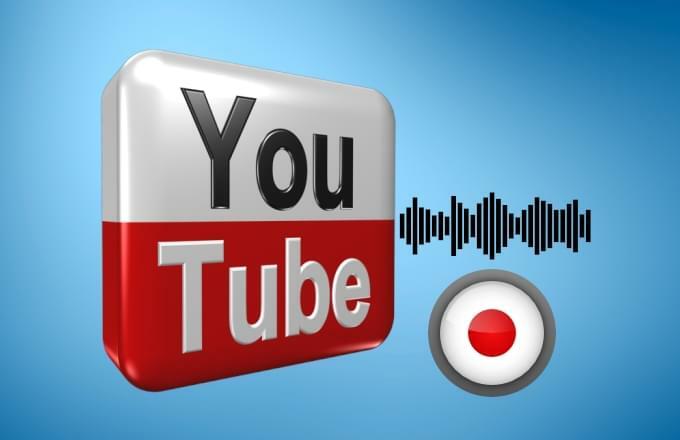 This free YouTube audio recorder has been well received by millions of users since its publication. Support recording audio from streaming video, internet stations, webcam, media players, etc. Provide elegant ID3 tags editor for users to add cover, title, artist, year, and so on. Save recorded file to computer hard disk as MP3 format. Allow you to playback the audio after recording via loop, single and shuffle modes. Support one-click to locate the recorded files exactly. Open Free Online Audio Recorder on your browser. Install the launcher at first if you haven’t used it before on your computer. Select audio source input as system sound and go to play YouTube video online. Click the red “Start” button to begin recording when you hear the sound you want to save. To skip any portion of audio you don’t like to save, just tap “Pause” button and “Resume” to keep on recording. Click “Stop” button when you finish recording. Tap “Recording list” button and then you are guided to another window. Here you can play files, edit ID3 tags or choose to record sound from YouTube once again. 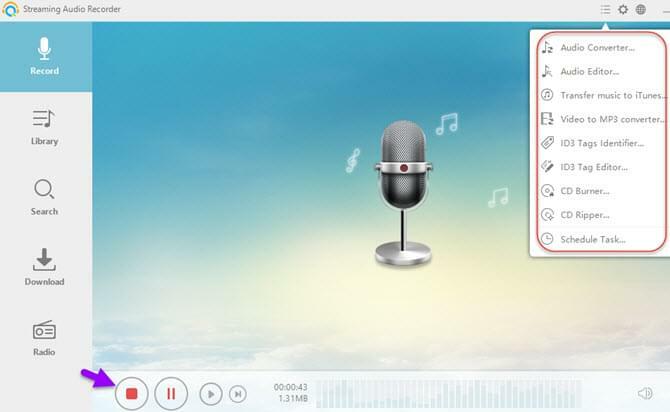 Streaming Audio Recorder is a full-featured audio recording program which lets you record sound in no time, listen to 36 genres of online radios, search any songs for downloading, and manage recording library. Plus, it comes with many excellent tools including audio converter, audio editor, video to mp3 converter, CD burner, CD ripper, ID3 tag identifier, ID3 tag editor and so on. It is not merely a YouTube sound recorder, but also a multi-functional audio application. If you are curious or fascinated by its powerful functions, just download and try it right now! Record HD quality audio playing on your computer system sound card or words speaking through microphone on PC. Save files in various formats such as MP3, AAC, WMA, WAV, OGG and FLAC. Endow you the ability to automatically skip silence, split track in specialized period, etc. Transfer audio files to iTunes for syncing to your iPhone, iPad or iPod. Provide built-in scheduler to schedule recording tasks at certain dates and times. Top 10 songs or 10 artists are available for you to download or listen to online for personal usage. Download it and double click it for installing. The whole process will just take you a very short time. Hit the Gear icon and scroll to Settings button, click it. Select General settings tab, you can set the keyboard shortcuts for starting, pausing and stopping audio recording. Select the Record settings, you are able to set the audio source, quality, format, output directory and do other advanced audio settings. Click “OK” to save what you have done. Play YouTube video now and hit “Record” button whenever you want to record sound from YouTube. You have the ability to control recording by clicking “Pause”, “Resume” and “Stop” buttons. Obviously, both of the above tools we talk about are very easy to operate and can record audio with perfect quality. Free Online Audio Recorder can only record audio through the mouse control and save it to MP3 format. Comparing to this, Streaming Audio Recorder will bring you a lot of benefits because of its versatility. However, Streaming Audio Recorder is not a free program which has some limitations like 3 minute recording, trial reminder, identifying 3 tracks only. Anyway, you may choose either YouTube audio recorder to accomplish your task according to your requirements.